I defended my Ph.D. thesis on June 25th 2018 at the Institut Fourier in Grenoble under the supervision of Philippe EYSSIDIEUX. My main interests are complex geometry and Hodge theory with interactions to formal deformation theory and homotopy theory. Title: Théorie de Hodge mixte et variétés des représentations des groupes fondamentaux des variétés algébriques complexes (Mixed Hodge theory and representation varieties of fundamental groups of complex algebraic varieties). 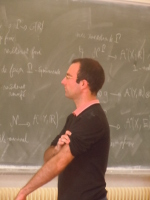 Mixed Hodge structures and representations of fundamental groups of algebraic varieties. Accepted in Advances in Mathematics. arXiv:1806.02688, hal-01809625. A criterion for quadraticity of a representation of the fundamental group of an algebraic variety. Manuscripta Mathematica, 152 (2017), no. 3-4, 381–397. DOI:10.1007/s00229-016-0866-7, arXiv:1509.02871, hal-01196355. Tutorial, Geometric Invariant Theory, Master. Language: English. Prof: Daniel GREB. Seminar on stacks (Summer Semester). Seminar on stacks (Winter Semester).